The Museum of Man in the Sea needs your help to continue to do the monumental task of preserving and displaying your heritage and modernizing its displays and facility. All donations go to the Institute of Diving Foundation. 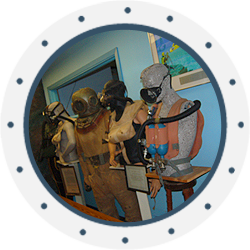 The Museum has been preserving and maintaining historical diving artifacts for the last 30 years and with your help plans to continue its safekeeping to inspire and awe future generations. Your support in the form of a donation to the Institute of Diving would be greatly appreciated. Any amount you contribute makes a difference. Please contact us if you have any questions about making monetary donations or volunteering. Your support in the form of a donation to the Institute of Diving would be greatly appreciated. As a 501(C)(3) non- profit organization, we will use your tax-deductible donation to further the goals of the Institute. Any amount you contribute makes a difference. If interested in volunteering, please contact us at (850) 235-4101 or [email protected].